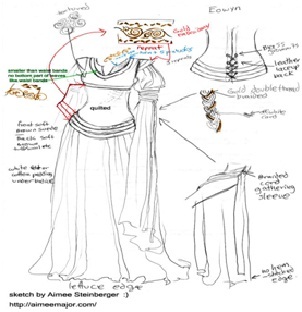 In the garment manufacturing the first step is designing the sketch for the dresses that have to be prepared. For this purpose the designer first draw several rough sketches in the sketch book. The designer also draws working drawings along with the sketch. Working drawings are flat drawing of the sketch and it help pattern maker in understanding the patterns involved in the construction. The pattern maker now develop first pattern for the designing any one standard size. 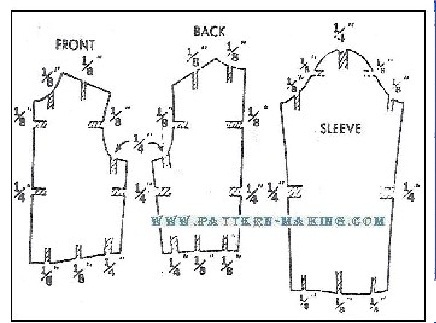 This is made by pattern drafting method and the purpose of making this pattern is to create the sample garment for test fit. The first patterns are sent to the sewing unit for assembling them into garment. This sample is constructed to analyze the pattern fit and design too. If any changes have to be made they are made at this time. The pattern design is now taken for creating the production patterns. 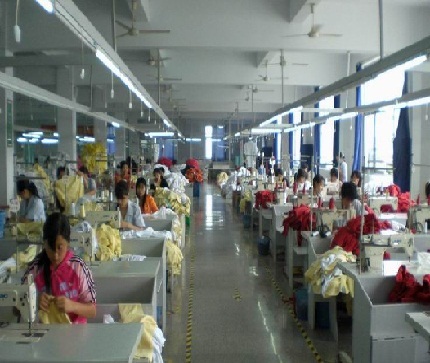 The production pattern is one which will be used for huge production of garments. The pattern maker makes the patterns on standard pattern making paper. 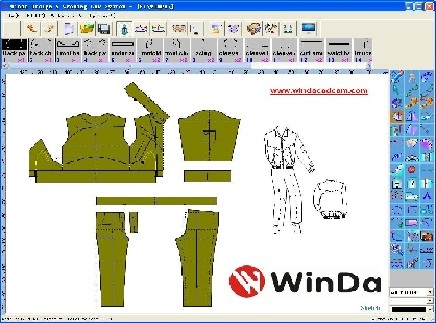 Garment patterns can be constructed by two means: manual method, CAD/CAM method. The purpose of grading is to create patterns in different standard sizes. Grading a pattern is really scaling a pattern up or down in order to adjust it for multiple sizes. Pattern sizes can be large, medium and small or else there are standard patterns of size 10, 12, 14, 16 and so on for different figure and statures sizes. This is generally how we get S M L XL XXL sizing. 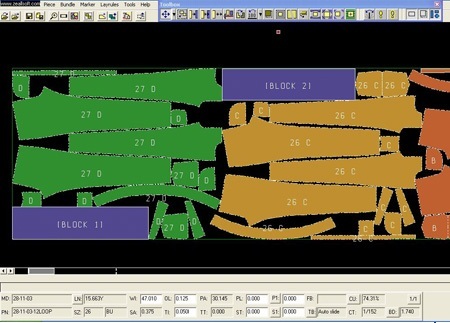 Pattern grading by manual method is a cumbersome task because the grader has to alter the pattern on each and every point from armhole, to neckline, sleeve cap and wrist by using CAD it is much easier and faster. The measuring department determines the fabric yardage needed for each style and size of garment. 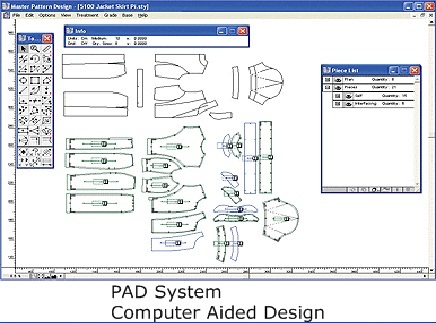 Computer software helps the technicians create the optimum fabric layout to suggest so fabric can be used efficiently. Markers, made in accordance to the patterns are attached to the fabric with the help of adhesive stripping or staples. Markers are laid in such a way so that minimum possible fabric gets wasted during cutting operation. After marking the garment manufacturer will get the idea of how much fabric he has to order in advance for the construction of garments. Therefore careful execution is important in this step. 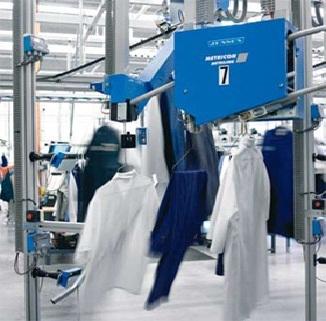 With the help of spreading machines, fabric is stacked on one another in reaches. The fabric is then cut with the help of cloth cutting machines suitable for the type of the cloth. This step requires much precision because making bundles of mismatched patterns can create severe problems. On each bundle there are specifications of the style size and the marker too is attached with it. The sewing process is a sewing different parts of the cut pieces. In this workplace, there are many operators who perform a single operation. One operator may make only straight seams, while another may make sleeve insets. Yet another two operators can sew the waist seams, and make buttonholes. 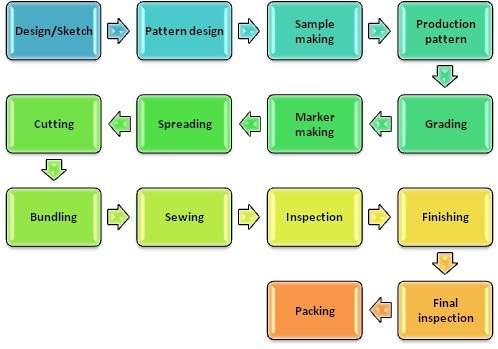 All these factors decide what parts of a garment can be sewn at that station. Finally, the sewn parts of the garment, such as sleeves or pant legs, are assembled together to give the final form to the clothing. 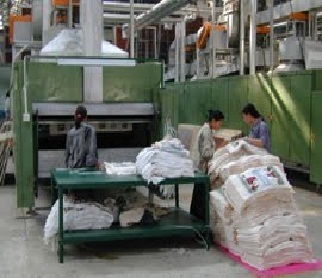 During this process of the quality control ,the section needs to check each prepared article against defects such as open seams, wrong stitching techniques, non- matching threads, and missing stitches. The next operations are those of finishing. Molding may be done to change the finished surface of the garment by applying pressure, heat, moisture, or certain other combination. Pressing, pleating and creasing are the basic molding processes. Creasing is mostly done before other finishing processes like that of stitching a cuff. For the textile and apparel industry, product quality is calculated in terms of quality and standard of fibers, yarns, fabric construction, color fastness, designs and the final finished garments. Quality control in terms of garment manufacturing, pre-sales and posts sales service, delivery, pricing, etc are essential for any garment manufacturer, trader or exporter. The finished garments are finally sorted on the basis of design and size and packed to send for distribution to the retail outlets.